ME & MY ROCKY MOUNTAIN | Riders Cycle Centre. Cycle repair and service workshop. 50+ 5Star Google reviews. Bicycle consultancy. Custom wheel & bike builder. Maintenance courses. I am going to try and put into words for the 1st time my own bike review. It would help if I grabbed a few back issues and got some pointers from the pros but I thought I would give you a regular riders and not a journalists bike review. Lets call it a Riders Real World Bike Review. I introduce to you the Rocky Mountain Altitude 750 650b 2015. To save me some time there is a link to the bike web page. Got to say I liked the look of the bike. The colours are not fluro euro but a bit too much orange for me (I peeled off the stickers on the rims which helped a lot). No dropper post, now that was a disappointment. What full suss doesn’t come with a dropper post nowadays. On the plus side I can not fault the finishing kit. All big brand names and some personal favourites of mine. Maxxis tyres, lock on grips, Race Face and Shimano. I did swap the group set for my own Shimano 1×11. The Altitude 750 comes with a 2×10 and fitted my trusted friend a Stella Italia Flite saddle but back to the frame and fork, the heart of the bike. Fox shocks front & rear with climb, neutral and descend adjustments. The bike comes with its fair share of tech, Smoothlink suspension, Ride-9, ABC pivots. Check out the bike link for all that geek tech. Time for a ride. I tuned the air pressure in the shocks, pumped up the tyres and adjusted the cockpit to my desired ride. Rocky Mountain have put the Altitude into the “aggressive trail” category. The copious amount of travel reflects that and the grippy tires don’t like the road shuttle run to the trails. The suspension adjustment dials can stiffen the road ride and you can tick off the miles until you hit the dirt. My chosen test loop was not going to be an “aggressive trail” but what is an aggressive trail?. The cockpit felt cramped but I have been riding a long distance hardtail for some time. I was at home with the wide bars and the Shimano shifting was dialled to perfection (that’s down to the pro mechanic, ME). But back to the frame and forks. One thing I did like about the Rocky Mountain was the Ride-9tm system. A simple way to adjust the ride and feel of your bike. So they have an aggressive trail bike with a suspension setting facility. I can change my 150mm rear suspension from an enduro setting to a climbers setting. Brilliant. Check out the video for more info. The Ride-9 feature is a winner for me. 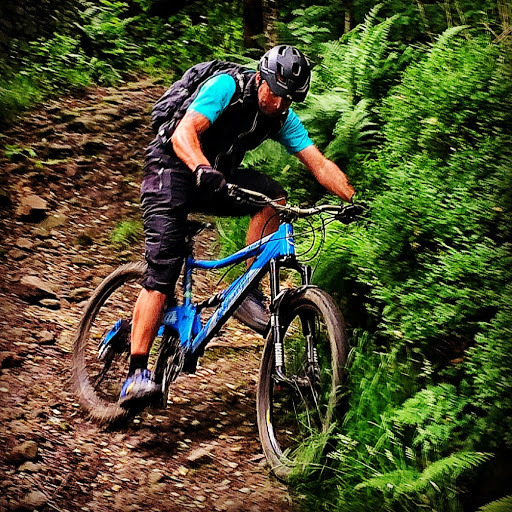 To be able to adjust the bike to suit your ride is a great feature that is not too technical, can be done before you set off for your ride, does not require a Cytech qualification to adjust and makes this aggressive trail bike more of a trail bike (don’t like pigeon holing a bike). So what about the test ride. I took the Altitude around a local loop and rode her to my own skill level. This included a few drops, some short steep climbs, some fast skidding and some bumpy trails. I have only ridden 32mm front forks so I was happy to say I could feel the improvement of a 34mm 15mm Fox fork. The rear suspension was supple and smooth and the 142mm through axle kept everything tight and stiff. Tick, tick and tick. 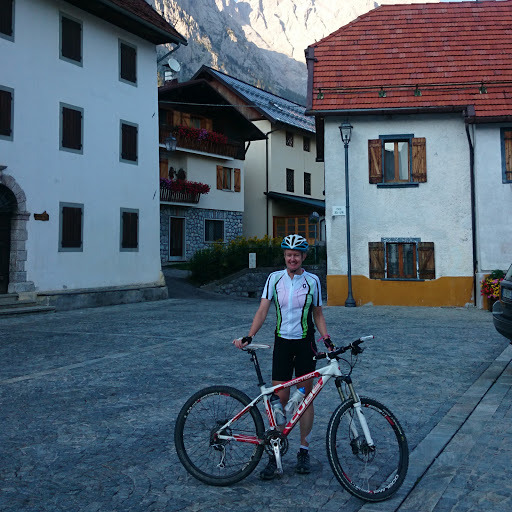 I very quickly acclimatised to the bike geometry and soon forgot I was riding a new bike as I attempted some technical trail. To me that is a good sign. Enjoy the ride asap. I should be saying something about the gears and brakes. OK then. The all worked perfectly and dialled in by a pro (Riders Cycle Centre). I have ridden Maxxis tyres for many years now and the Minion Ardent combo are old reliable friends. We got on very well together with reliable grip and traction. What else can I say for my 1st bike review. I like the brand. It has a long illustrious connection to the mtb world. I like the frame and their choice of components and they have plenty of models and prices to fit into your budget. Their technology is original and for me the big selling point. The Ride-9 system is a big plus and with so many bikes and brands battling to get you aboard their stead this type of tech is a head turner and gets my attention. The proof is in the pudding. With the bike set in enduro and slack mode I descended off a local mountain cleaning a particularly steep stone section for the 1st time and the following weekend I set the bike up with a steeper head angle with stiffer suspension and took on a local XC loop with some testing climbs. A versatile bike, perfect. Please check out the link and take a look at my last few rides on the Rocky mountain. Me and the bike are getting to know each other very well. I am excited to ride her on my memory bank of trails. All those bumps rigid rides now aboard a full suspension comfort machine. I have often remarked to my customers (tongue in cheek) that the full suss talent compensators are for the Ikea trail rider. Got to say at 44 years old maybe I need this in my life. Between my overnight bivvy rides and my hike-a-bike mountain adventures I want that adrenaline. It reminds me how much fun it is to descend at warp speed without shattering my teeth or being bounced offline and into the trees. As I said “talent compensators”. The weekend brought the 1st snow of 2016. With a few fresh inches of snow and frozen trails underneath we spent a few hours laying down some tyre tracks. We skidded and we climbed. We had fun and it was only the pain of frost bitten toes that brought the ride to an end. Enjoy the (short) vid. So what next for my bike. I am going to convert the wheels to tubeless and invest in a dropper post and that’s about it. Its ride time and a 2016 to look forward to.